The Epiphone “Texan” FT-79 is the successor to an earlier Epiphone guitar, an answer to the brand's '40s flattops. Right after Gibson bought Epiphone in '57, the company redesigned those '40s flattops to incorporate some of the design elements of the Gibson J-45, giving birth to what they eventually renamed the “Texan.” It remains one of the iconic flat-top guitars of all time, for players and collectors alike. The Texan was made popular by Paul McCartney for the recording and the live performances of the hit song from 1965 "Yesterday". It is also famous for being the acoustic guitar on which McCartney performed the signature "McCartney Picking" in some album pieces such as "Mother Nature's Son" (The Beatles "White Album"), "Calico Skies" (Flaming Pie), and more recently "Jenny Wren" (Chaos and Creation in the Backyard). Kurt Cobain of Nirvana used an Epiphone Texan on the 1994 In Utero tour. Notably, British folk guitarist Wizz Jones has also been known to play an Epiphone Texan. Bert Jansch, another prominent force in the British folk scene, played one briefly live in a 1965 concert. Also, Graham Nash used an early customized black (originally "cherryburst") Epiphone Texan while in The Hollies and during the beginnings of Crosby, Stills, Nash and Young. Other artists with which the Texan is identified are Benjamin Gibbard; Tom Rush; Al Stewart; Noel Gallagher; Stephen Bruton, who bequeathed his beloved first guitar to his longtime friend, T Bone Burnett; Peter Frampton; Justin Townes Earle; and Rina Katahira. This particular Epiphone model made quite a transition when the Gibson company purchased Epiphone in 1957. The FT-79 had previously been made with a long scale neck and a peanut-shaped walnut or maple-bodied guitar with an arched back. The Gibson acquisition meant that many of the half-finished parts from the old Epi factory were shipped from New York, NY, to Kalamazoo, MI. Like many of the 1957-1960 Epiphones, Gibson mated leftover Epiphone necks to Gibson made bodies. The new Texan was essentially a long scale J-45/J-50, meaning loud long-scale volume and big mid- to low-end Gibson thump. Once the New York-made necks ran out, Gibson continued the long scale length as the main structural difference between the Texan and the J-45/J-50. In 1958 the Gibson-made FT-79 had “Texan” added to the type name, the shape was changed as mentioned above, the epsilon Epiphone logo was added to the pick guard and the truss rod cover, and the tuner knobs were changed to white plastic. In the late 1950s the body wood was changed to Mahogany. 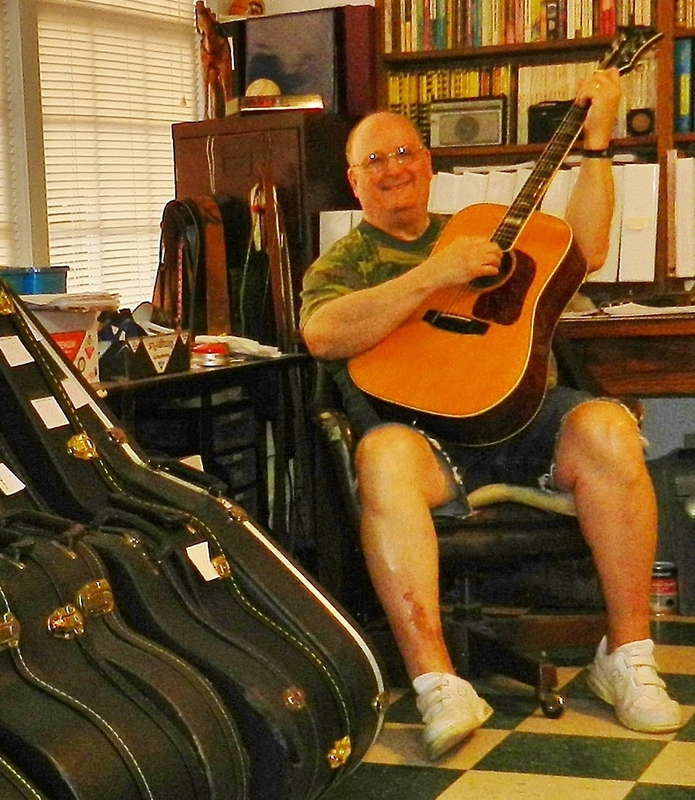 All Texans in these years were Solid Mahogany with Solid Sitka Spruce tops. In 1962 the adjustable bridge was introduced. In 1967 the tuner knobs were changed to metal. In 1970 the model was discontinued as a result of the acquisition of the Gibson company by a new owner. The “Texan” being offered here is apparently from early 1967, judging from the serial number (063851) and the fact that the tuner knobs have not yet been changed from the earlier white plastic to metal. It has the specified solid Sitka Spruce top; solid Mahogany back, sides, and neck; Brazilian Rosewood fretboard with a 25 ½” scale length and inlaid parallelogram fret markers; Rosewood bridge with adjustable wooden saddle; the later 1 9/16” nut width; a bright sunburst finish; and a double-bound body. Structurally, the bridge looks to have been re-glued and probably replaced, and there are several carefully repaired cracks in the top. Cosmetically, it looks like the authentic Real Deal that it is: lotsa crazing or checking all over, considerable “buckle rash” on the back, and some slight wear on the frets and fretboard, but that’s all OK, because it’s a great playing music machine, louder and fuller than any J-45 I’ve ever played. And that’s what it’s all about, right? It currently is in the new deluxe WJM hard shell case shown in the pictures rather than the really scruffy chip board case in which it came. I can probably swap it into a more vintage case if you prefer at no charge, but I feel better shipping it in something substantial. This WJM case has an arched top, fresh plush interior, shiny hardware—even keys, but the decision will be yours. Buyer pays a flat rate of $55 for insurance and shipping to the lower 48 states; shipping costs elsewhere will be negotiated as necessary. Payment by Paypal is preferred; cashier’s checks are acceptable, but checks must clear before the guitar will be shipped. I have made every effort to describe and illustrate this guitar with scrupulous accuracy. Please check out the pictures and ask any questions you might have before offering to buy it. Its return will not be accepted unless it can be shown that it was egregiously misrepresented in this listing. Thank you for your interest in this iconic guitar.